At LeViness, Tolzman & Hamilton, P.A., we have assembled a team of experienced, trial-tested lawyers that has been recognized by former clients and our peers in the legal community. Our attorneys have recovered more than $100 million in compensation on behalf of our clients and achieved successful outcomes at trial. We have been listed in Super Lawyers magazine, listed among the Top 100 Trial Lawyers, as a Top Lawyer in Maryland, and as a 10 Best in Client Satisfaction by the American Institute of DUI/DWI Attorneys. We are also members of numerous legal and professional organizations, including the National Association of Consumer Bankruptcy Attorneys (NACBA) and the National Organization of Social Security Claimants' Representatives (NOSSCR). In addition to our legal work, we give back to our local communities by serving on various charitable and corporate boards. To learn more about LeViness, Tolzman & Hamilton, P.A., reach out and schedule a free consultation at one of our four Maryland office locations. From the time our practice was established in 1987, the Maryland personal injury lawyers at LeViness, Tolzman & Hamilton have successfully obtained more than $100 million in settlements and verdicts for our clients. 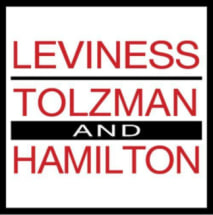 Since 1987, LeViness, Tolzman & Hamilton, P.A. has helped people injured in auto, trucking, motorcycle and pedestrian accidents. LeViness, Tolzman & Hamilton, P.A. was established in Baltimore 33 years ago to help families like yours who have been torn apart because of the negligence of another individual or corporation. Hurt on the job? Call LeViness, Tolzman & Hamilton, P.A.. We have been representing injured employees with Workers’ Comp claims, including those with work-related accidental injuries and occupational diseases, throughout Maryland. LeViness, Tolzman & Hamilton, P.A. can give you the decisive edge when handling your bankruptcy case. Our experience, know-how, and resources will assist you with the process.